The wire material was drawn in several steps from 5,50 mm to 2,50 mm. Between the individual drawing events a solution annealing was carried out. Material overloads then probably have appeared at one of the last drawing steps by insufficient lubrication of the wire, lubricant demolition. The wire has in places rubbed in the drawing die and the flow behavior was influenced adversely. Small transverse cracks have appeared in the places of insufficient lubrication and then, in the pulling stone, have torn the material because of the reduction of the cross-cut. 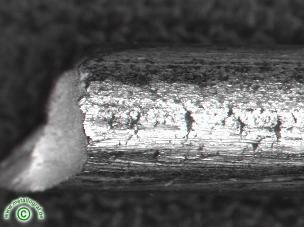 Shiny places and scaly surface are indications of this defect.